Software provider Stardraw.com has announced a significant enhancement to their most sophisticated design/documentation product yet, the award-winning Stardraw Design 7 software package. 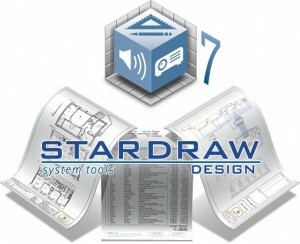 The upgrade follows a period of intense beta testing by a select group of Stardraw Design 7 "Power Users". The principal object of the beta was to test a new version of SD7 with optimized memory handling for a noticeably faster, smoother and better overall experience, particularly when working with very large project files. The new version offers all the same features and functionality as before but a huge amount of low-level work has been carried out with the result that file operations are faster, file sizes are generally smaller and overall memory usage is significantly reduced. Rob Robinson, CEO at Stardraw.com, commented: "As always happens with software, Power Users emerge that push the tool to its limits and, when it’s a powerful and flexible package like SD7, they often use it in ways that may not have been foreseen during development. This is great and it leads to the sort of improvements and enhancements represented by this new release – thanks go to all our users, particularly the Beta group that have been pounding on this prior to release and helping us make Stardraw Design 7 an even better tool for systems integrators everywhere." Based on the positive feedback of the Power User group, the new version has now been released and is available for download on the Stardraw website.